James Coney Island Juicy Lucy is an amazing burger, from a place that is typically known for their hot dogs. If you have never tried one of their hamburgers, you are missing out. James Coney Island is a place that has always been known for their chili, and their delicious hot dogs, but they make so much more than just hot dogs. They have a grill, and their burgers are also pretty amazing. One of my favorite burgers there is their Juicy Lucy. The Juicy Lucy is a hamburger that is stuffed, so this burger is filled with all sorts of savory cheese. What makes this Juicy Lucy so is starting off with a ground meat that isn’t too lean, and it isn’t too fatty. 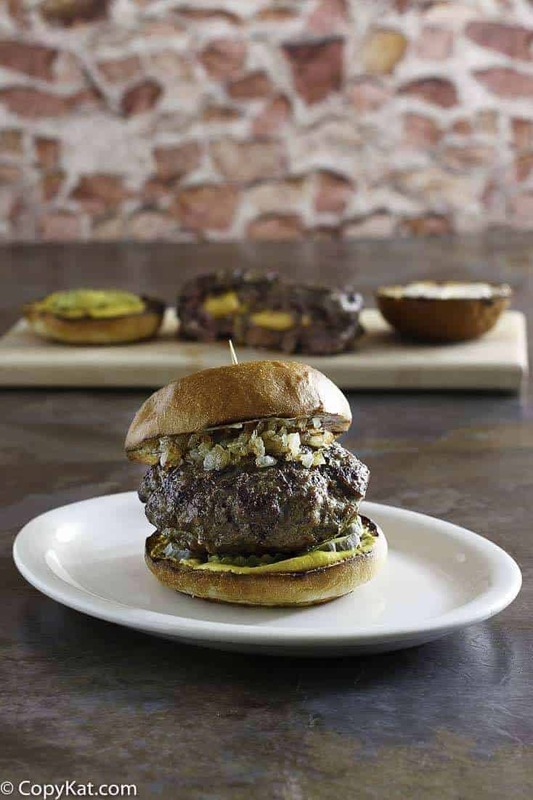 Ground chuck which tends to be about 80% lean is perfect for making a burger. They also add in cheese, between the patties, so it is like an inside-out cheeseburger. They use American cheese to fill the burger. American cheese isn’t the as Velveeta if you need to purchase American cheese, go to the Deli department of your local grocery store and buy a few slices there. This burger also gets topped with grilled onions; nothing tops a burger like grilled onions. Add a few slices of dill pickles, and you have one amazing Juicy Lucy. If you have never had a stuffed burger, you are missing out on one amazing treat. Place the ground chuck in a medium0sized bowl and mix in the salt and the pepper. Form into eight patties, 1/4 inch thick. 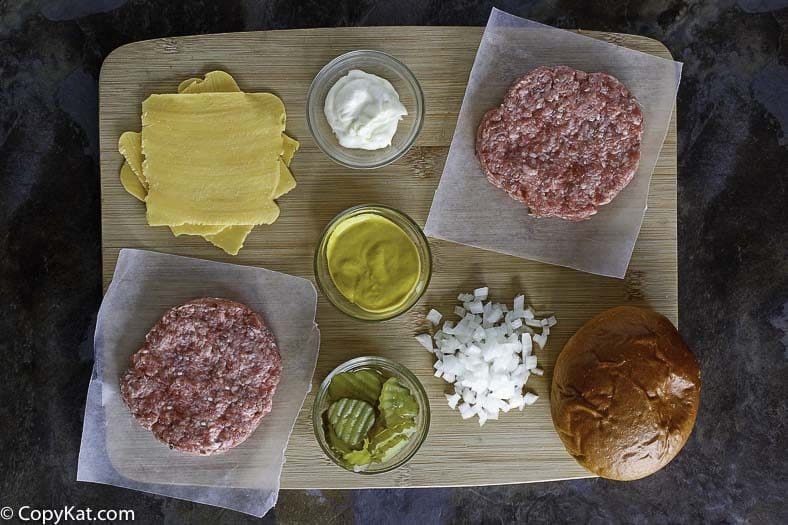 For each burger, cut a slice of cheeses into quarters and arrange them to fin on a meat patty. Top with another meat pepper and press the edges together so that no cheese will leak out while the burger is cooking. .
Heat your grill to about 375 degrees. You can also use a skillet on medium heat. Place the patties on the grill and cook until the meat has browned on the bottom side, do not press the patties. But leave them undisturbed while they cook. Flip and cook the other side for 3 to 4 minutes. While the burgers are cooking, butter the hamburger buns and toast them on the grill, buttered side down, until golden brown. Saute the onions in the vegetable oil until they are golden brown on the grill or in the skill over medium heat, frequently stirring, so they do not burn. 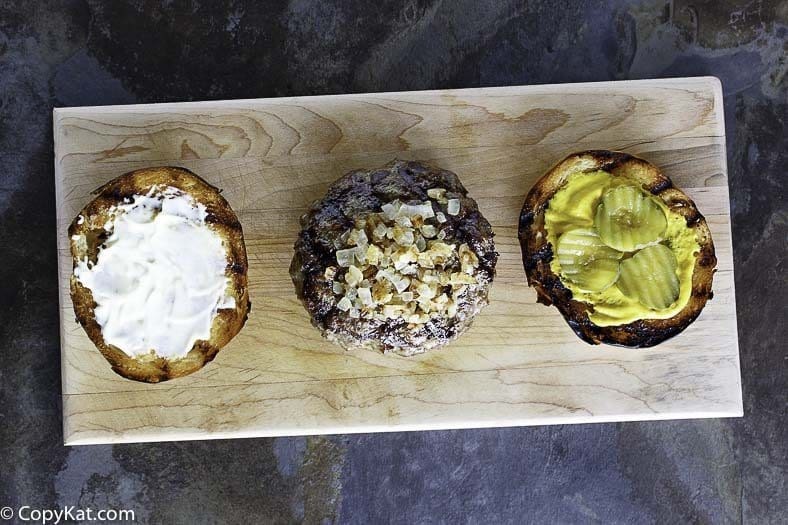 To assemble each burger, build up from the bottom, spread one teaspoon of mustard on the bottom bun, place three pickles over the bun, add the grilled hamburger patty and top with grilled onions. Spread mayonnaise on the top bread before putting it on top of the burger patty. I was always under the impression that the Juicy Lucy was a Wisc. recipe? Reguardless, James Coney Island will be tested soon as we have a neighborhood street hamburger cook off contest. on Halloween night. The kids get their candy, the adults with the kids get a shot of Southern Comfort or Apple Cider if they choose. For the past 20 years, 90% of the adults have chosen the Southern Comfort. We have many repeat customers!!!! I have no idea on what the origin of the Juicy Lucy. All I know is it is a delicious stuffed burger that is hard to resist. Thank you for always leaving so many comments. I always look forward to your comments. Matt’s Bar and the 5-8 Club in Minneapolis claim the original Juicy Lucy.. They are about 3 blocks apart on the Southside. Wisc. has no claim whatsoever. Who knew? Everything looks so good I guarantee I’ll try 90% of what you publish. Thanks Walter 😉 I sometimes do recipes that I personally don’t love the dish, but people request the recipes, so I do my best.